Walter Hall was originally a women's residence hall, named for the only daughter of Harvey Scott, Pacific University's first graduate. Today, Walter is a co-ed residence hall for students that are generally 18 years old and older prior to the start of the Fall term. It has single and double rooms, a community kitchen and lounges, and laundry facilities. 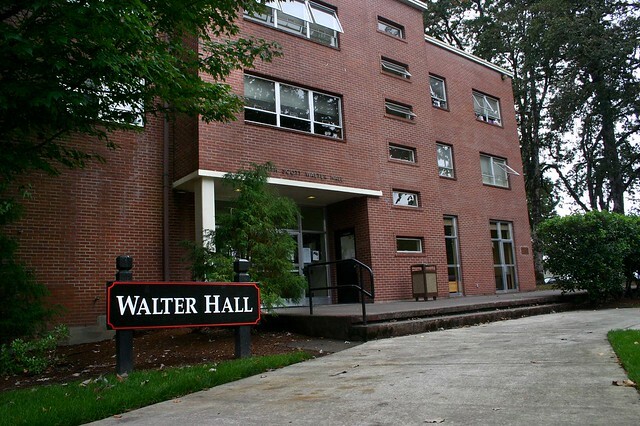 Walter Hall is Pacific's largest residence hall and home to over 240 coed residents. Walter is made of singles, and doubles, with gender specific restrooms on each floor. This residence hall houses students that are generally 18 years old and older prior to the start of the Fall term.